National Science and Media Museum0844 856 3797work MuseumThe National Science and Media Museum, in the heart of Bradford, explores the science and culture of light and sound technologies and their impact on our lives. With the aim of inspiring the scientists and innovators of the future, it invites visitors to see more, hear more, think more and do more. Its galleries and exhibition spaces help illuminate world-famous collections in photography, film and television. Explainers create learning activities that fuel the imagination and investigate the collections and exhibitions. Three cinema screens—including an IMAX theatre— showcase the magic of moving images from around the world in Bradford, the first UNESCO City of Film. Don't Miss: The NEW interactive gallery Wonderlab which explores the science of light, sound and perception through state-of-the-art, hands-on activities and breath-taking shows. The National Science and Media Museum, in the heart of Bradford, explores the science and culture of light and sound technologies and their impact on our lives. With the aim of inspiring the scientists and innovators of the future, it invites visitors to see more, hear more, think more and do more. 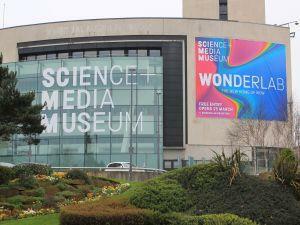 Admission to the National Science and Media Museum is FREE (charges apply for cinemas/IMAX). Cinemas and bar open until late. Telephone hours: 09:00 - 13:30 (Monday - Friday). A voicemail service operates at all other times.